Use your handout with these directions to discover the formula for finding the sum of the interior angles of any polygon. 1. Complete the table on your handout up to a polygon with 8 sides. As you complete each row, look for patterns in order to predict the sum of the next shape. 2. Once you complete the octagon, make a prediction for the measurements of a dodecagon. Use the slider to check your answer. Were you correct? 3. 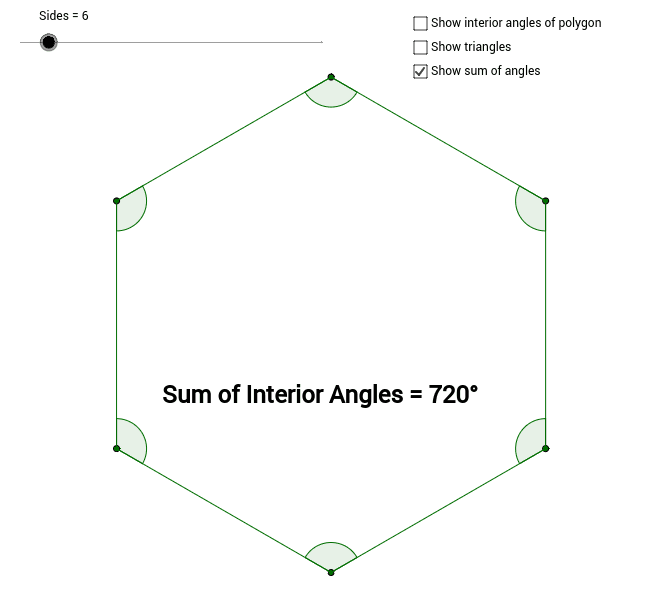 If you were asked to calculate the sum of the interior angles of any polygon, you should be able to do it without using this page. Come up with a formula that will work for n sides. (Hint: Click on the "Show triangles" box for a clue) 4. Use your formula to predict the sum of the angles of a 20-gon and a 30-gon. Use the slider to check your prediction. If you were incorrect, adjust your formula to make it work. 5. How could you find the value of one interior angle in a regular polygon if you know the sum?